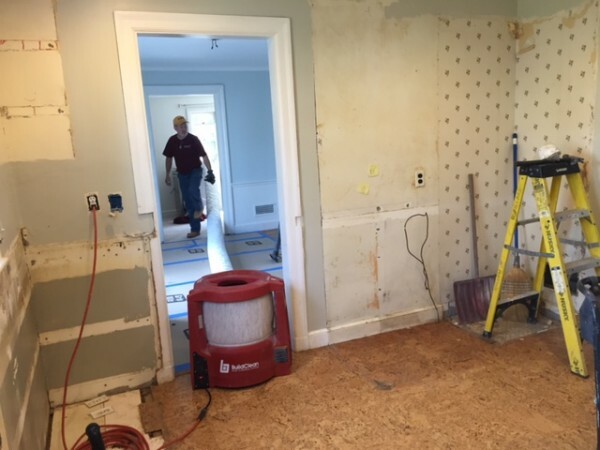 Remodeling has changed from showing up at a client’s home and make a complete mess; to a more professional and healthy approach involving HEPA air scrubbers, floor protection; plastic dust wall systems and HEPA vacuums connected to all your tools. Now in the residential/commercial remodeling world we can offer our clients 90 percent less airborne dust in their homes or businesses. We can achieve this by using the BuildClean Dust Control System. This approach can be your advantage to take the leading edge away from your competitors, by providing a healthier job site and allow your clients the ability to have a livable remodel. Plastic housing is job site ready, easy to clean, resists scuffing and denting. Hour meter to confirm running hours on the job and filter use. 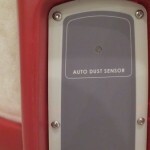 Auto dust sensor and has its own status light. Two stage filter system, Pre-filter and HEPA filter. Filter Status Display, easy read LED indicator lights. 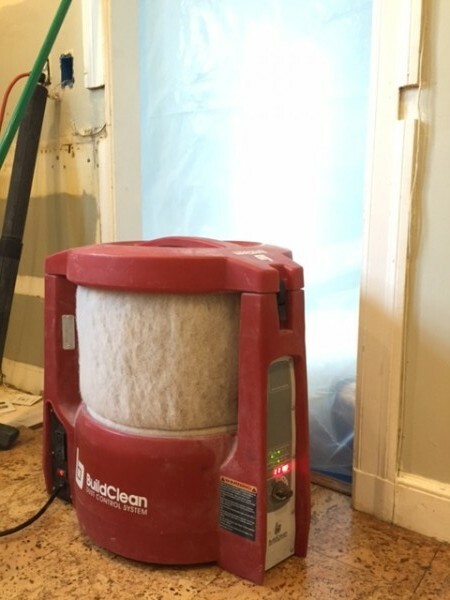 BuildClean provides you with four options to clean the air you just filled with dust. Below is a list of the machines settings and recommended uses. Having used the air scrubber on a few projects now and being able to dial in the particular setting is priceless. Our first project was hanging 24 sheets of blue board in a basement. The air scrubber was set on high and we let it just clean the air. By the end of the day we were amazed to see how much was collected just on the prefilter. Also adding into the conversation was the amount of dust and particles we did not breathe in. 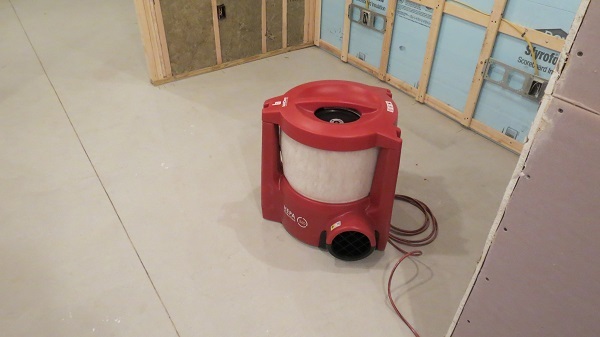 The BuildClean 360 air scrubber was quiet enough to where we could still communicate on the job site. A huge plus was not getting a headache from having a machine run all day within feet from our work area. 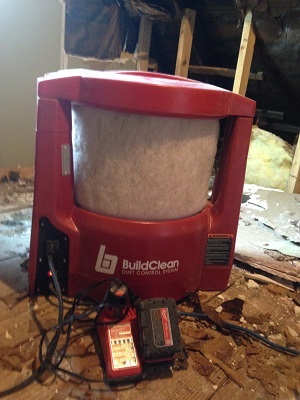 On the next 2 interior projects, the BuildClean air scrubber benefits were noticeable, each time. 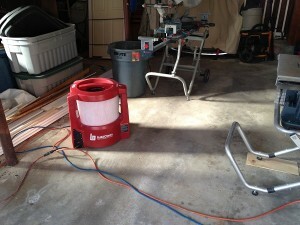 The first project the air scrubber was running in a client’s garage as we were milling custom, interior trim. There were no dust clouds to enter the house as we came in and out of the door to the house. The unit was set on high and in the recirculation mode. This next project, really showed how BuildClean Dust Control System scrubbed the air, kept our lungs cleaner and reduced filling up the master bed room with dust. The project was to demo a master bed room closet (10’x 11’) and build a new custom closet. The air scrubber was set on auto and then we observed the white filter turn brown. Needless to say, my client was happy they did not have a pile of dust on their bureau. I was impressed with the amount of dust collected and no dust clouds in the air. 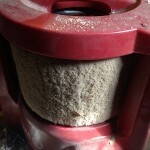 I did at one point vacuum the prefilter to increase efficient of the machine and filters. Another feature that was used a lot is the auxiliary outlet. 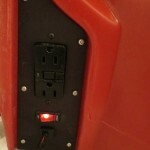 This GFCI outlet was constantly used to charge the array of cordless tools. Bret Norton from BuildClean had three helpful tips. Never use a blow gun to clean your filters. Preferred method is to use a HEPA vacuum or replace them when the filter indicator light appears. Vacuum out or blow out the auto dust sensor and the black rubber air intakes to keep your machine running quiet & smooth. Customer service from BuildClean Personnel. First example is after the air scrubber arrived about 1 week later Bret called to follow up. I just thought it was a nice touch and had never experienced that before. Next I was able to meet up with them at JLC LIVE Residential Construction Show. Having the chance to connect with BuildClean’s Brian Paich and Bret Norton on more of a personal level than just emails & phone calls was just a great experience. 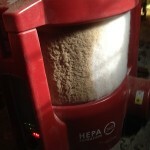 BuildClean Dust Control System 36-0 HEPA air scrubber is a well thought out machine. My only recommendation is to have a longer power cord. While I recognize that the short cord helps keep the unit priced competitively, if the power cord was 25’ with a built in cord reel or cord mount that would be perfection. The BuildClean Dust Control System clears a 6,000 cubic foot room in just 12 minutes 40 seconds, that’s a 20’ x 30’ x 10’ room. The unit costs $1,030.00. The unit has a replacable $23 pre-filter to protect the internal, more costly $150 HEPA filter. 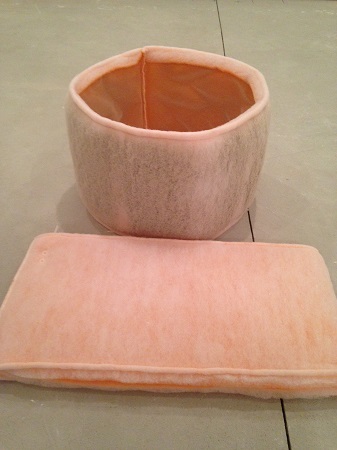 The prefilter will last approximately 30 days. 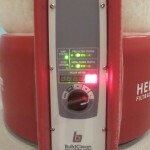 The unit tells you when the internal, HEPA filter needs changing with its stop light style indicator. Replacement is recommended after 1 year or 5,000 hours. BuildClean also offers an 8” x 25’ structural vent hose which is used to create negative pressure in a room. The cost for the vent hose with clamp is $ 65.91. Anything that you need for your air scrubber can be ordered directly from www.buildclean.com. Were do we start; I am just completely floored by this air scrubber. The benefits of healthier lungs, HEPA filtration and reducing airborne dust in your client’s homes are priceless. This system is very easy to operate, maintain and transport from job site to job site. BuildClean has a great website to show and explain in detail how the BuildClean Dust System will benefit their remodel project whether you’re the contractor or home owner. 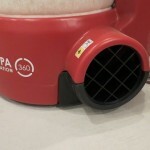 This air scrubber can also be used as a marketing/ sales pitch to your potential client. By using BuildClean Dust Control System you will provide 90% less airborne dust and provide a livable remodel with everyone breathing easy.